I can never decide whether to admire actors delivering monologues for their courage or pity them for taking on such a risk. There is nowhere to hide when you are flying solo. No-one on stage to provide a prompt. No-one to distract the audience from your mistakes. It’s them and you. And that’s the simple truth. 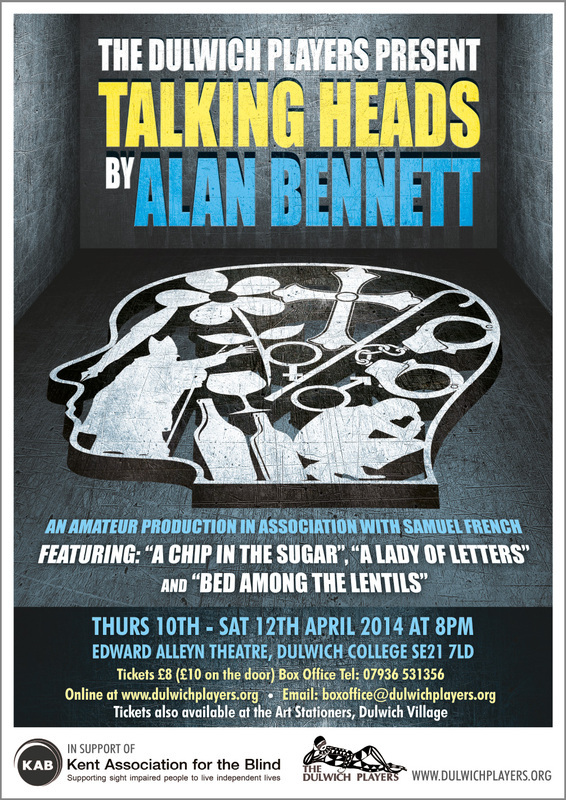 All credit, then, to the three actors on Alan Bennett’s three Talking Heads plays in the Dulwich Players spring production. They were really admirable. James Brown, on first, could have qualified for a West End staging of “A Chip in the Sugar” in his portrayal of Graham, a tragic figure living with his mother at an advanced age. Brown’s accent would not have disgraced Alan Bennett. In fact, when I closed my eyes, he could have been Alan Bennett, recalling the day his mother stumbled on an old flame. And how she fell, hook line and sinker for someone who was never to be trusted. Brown’s pauses were pitch perfect. You also developed a real sense of time passing through his changes in pace – plus the efforts of Geoff Forster, whose lighting was effective throughout, as was sound, delivered by Steve Borrie. Brown’s portrayal of Graham waiting for his mother to come home from her date was beyond poignancy. We had heard a little of Graham’s mental troubles. But a little goes a long way in Talking Heads. We lived in fear that he might suffer from a relapse. We cheered when it transpired his mother could come back to him after all. The mother, of course, never appeared on stage. But this play was as much about her as Graham. And Brown effortlessly brought both of them to life. Lydia Dickie had a tough act to follow, coming on second as Irene in “A Lady of Letters.” Her task was particularly difficult because her play, at least in my view, was more difficult than the others in lacking a key off-stage character to bounce off. Instead we had a series of episodes where Irene’s habit of despatching letters of complaint in indelicate ways led to her undoing. The play ended with Irene getting her just deserts. Or did she? Even when sentenced to a prison term as a public nuisance, she remained firmly in denial. Dickie tackled the task effectively, delivering her lines with an air of misplaced innocence which, at the outset, made you wonder whether she actually had a point. Steadily, her vindictive nature became clear. Early on, she accused a lollipop man of playing with little children. Later, she suggested her neighbours were neglecting their child home alone, when they were actually visiting him in hospital. She was guilty, as charged. Louise Norman triumphed in the third play, “Bed Among the Lentils” which concerned her husband, a vicar, as much as her own character, Susan. Norman nailed her part by successfully mixing suppressed anger with vulnerability. She told the story of a woman coming to pieces and turning to alcohol – and the affections of a corner shop grocer - for comfort. She also told how her thoughtless husband uses her illness as a way to secure the pity of his seniors, in a bid to secure promotion. We admired her battle to stay on the wagon, and come to terms with a loveless marriage, following the departure of her favourite grocer. None of this was easy, as Norman’s portrayal made clear. No review can be complete without a tribute to director John Hedley. In the programme notes, he writes: “My role has been largely to sit back and admire these three fine talents in action.” I suspect, he played a rather bigger role than this in helping to coax such tremendous monologues out of his cast. Any misgivings I might have had about the wisdom of putting on such an intimate production in a large venue like the Edward Alleyn Theatre were quickly dispelled as the first monologue got under way. In “A Chip in the Sugar” Graham (James Brown) relates the story of his mother’s re-acquaintance with an old flame (“Pre Dad? I’m surprised you remember him. You don’t remember to switch your blanket off”). James, as the devoted son, was outstanding. 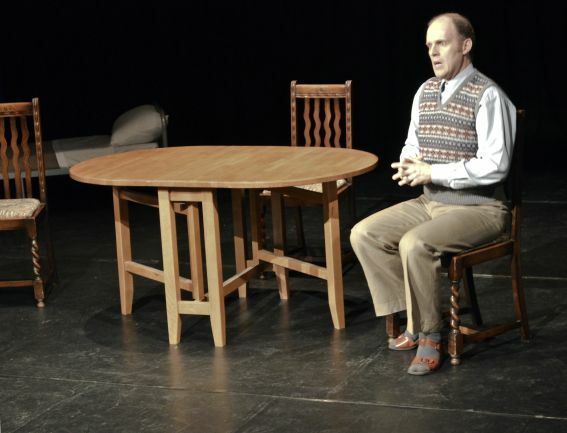 His portrayal of Graham was funny, sad and poignant in turn, and the audience was captivated. James gave us voices for his mother, Mr Turnbull and the Vicar, and the changes in timbre and pace created an enthralling performance. The monologue finished with Graham and his Mum together as before, content in their mutual dependence and with Mr Turnbull just a metaphorical ‘chip’ in the sugar. 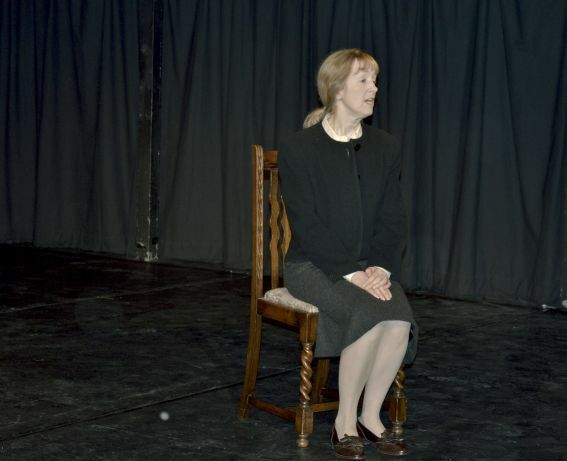 The second monologue was performed by Lydia Dickie as Irene, the eponymous “Lady of Letters”. Those who have seen Patricia Routledge in the television role might consider her a hard act to follow, but Lydia brought a new dimension to the role, giving movement and variety to the piece, and moving seamlessly from her bitter comments early on about “Prison, they have it easy…it’s just a holiday camp”, to her enthusiastic response when she gets there: “This is the first taste of freedom I’ve had in years”. Lydia has performed some choice roles over the years, but this must surely rank as one of her best. 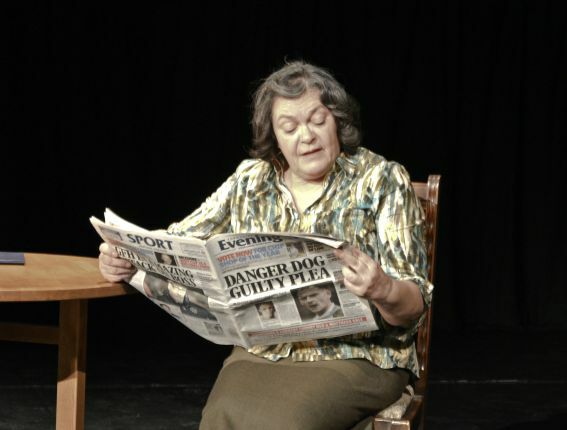 Susan (Louise Norman), the Vicar’s wife in “Bed Among the Lentils” performed the third monologue, and Alan Bennett’s familiar themes of Vicars, isolation and the multi-cultural society were repeated once more. Susan wonders why the Vicar’s wife is expected to go to church at all and opines, “So long as you can run a tight jumble sale you can believe in what you like”. Louise has performed some strong roles with the Players, a Headmistress in “Daisy Pulls it Off”, and the unforgettable Lysistrata. This understated performance was much more akin to her role in “A Woman in Mind”. You get an inkling of things to come at the outset when she comments that the woman at the off-licence didn’t smile, “I can’t think why. I spend enough”. When she finally attends AA she does so ‘religiously’ and complains that her husband uses her as a wonderful example of God’s redemption. Louise managed to combine unconscious piety with barely repressed lust in a fine performance. 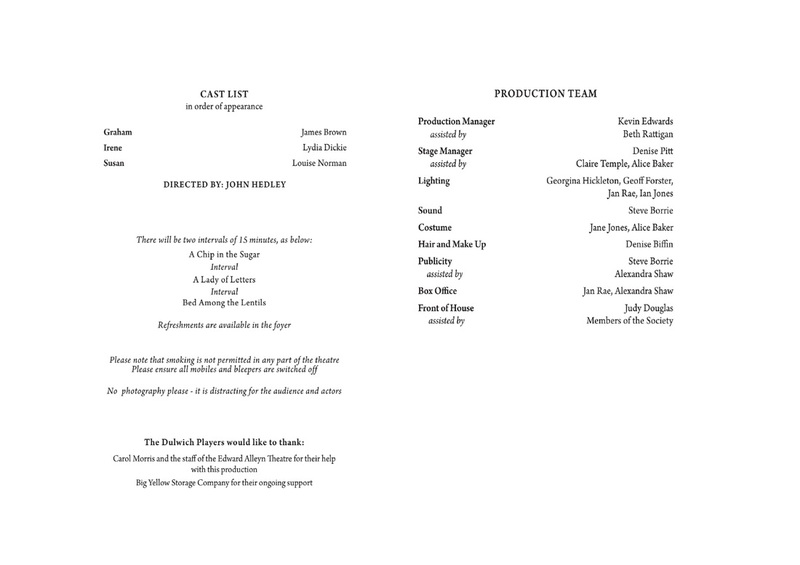 John Hedley, the Director, has done an excellent job. If you didn’t go you missed a treat. 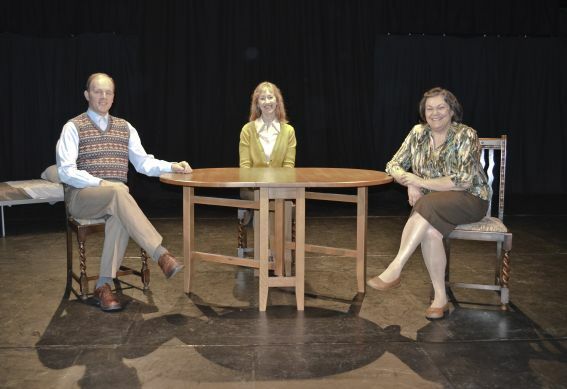 James, Lydia and Louise are three of the Players’ most accomplished actors and they certainly did us proud.